Featured: Honoree recipients at the 85th Annual Edinburg Chamber Installation Banquet, which was held on Wednesday October 25, 2017 at Memorial Events Center. From left: Elva Jackson Garza, Member, Board of Directors, Edinburg Chamber of Commerce (Edwards Abstract and Title Co.); Letty González, President, Edinburg Chamber of Commerce; Jacob De León, Immediate Past Chairman, Board of Directors, Edinburg Chamber of Commerce (Memorial Funeral Home); Manuel N. Cantú, Jr. 2017 Edinburg Man of the Year (Rio Valley Realty); E. Linda Villarreal, MD, 2017 Edinburg Woman of the Year (Memorial Medical Clinic); Pat Barrientos, 2017 Edinburg Chamber Ambassador of the Year (Edinburg Executive Center); Gabriel Espinoza, Jr., 2017 Edinburg Fireman of the Year; Martín Martínez, 2017 Leadership Award (City of Edinburg Parks and Recreation Department); and Alex Ríos, Chairman, Board of Directors, Edinburg Chamber of Commerce (Kids’ Kollege Learning Center and the Office of State Representative Terry Canales, District 40). These business and community leaders were honored for their achievements and dedication to the region. Edinburg’s retail economy from November 2016 through October 2017 has generated more than $20.9 million in local sales taxes, compared with more than $21.1 million for the same 12-month period the previous year, the Edinburg Economic Development Corporation has announced. The amount of local sales taxes collected helps reflect the strength of an economy, along with construction activities, per capita income, education, historical performances, and related trends. The sales tax, formally known as the State Sales and Use Tax, is imposed on all retail sales, leases and rentals of most goods, as well as taxable services. Texas cities, counties, transit authorities and special purpose districts have the option of imposing an additional local sales tax for a combined total of state and local taxes of 8 1/4% (.0825). From November 2016 through October 2017, Edinburg’s retail economy produced $20,934,767.43 in local sales taxes, compared with $21,171,250.82 for November 2015 through September 2016, a decrease of 1.11 percent. The year-to-date figures, which under the reporting system used by the Texas Comptroller of Public Accounts, begin in November of each year and end in October of the following year. For October 2017, Edinburg’s retail economy produced $1,624,490.61 in local sales taxes, compared with $1,644,571.30 in October 2016, representing a decrease of 1.22 percent. The local sales tax is also used in Edinburg to help pay for many city services, while the Edinburg Economic Development Corporation uses its one-half cent local sales tax to help generate economic development in the city. The Edinburg EDC is the jobs-creation arm of Mayor Richard Molina, Mayor Pro-Tem David Torres, Councilmember Homer Jasso, Jr., Councilmember Gilbert Enríquez, and Councilmember Jorge Salinas. The Edinburg EDC Board of Directors is comprised of City Councilmember Gilbert Enríquez as President, Edinburg School Board Trustee Miguel “Mike” Farías as Vice-President, Isael Posadas, P.E., as Secretary/Treasurer, and Julio César Carranza and Noé Sauceda, Ph.D. as Members. Edinburg’s retail economy from November 2016 through October 2017 has generated more than $20.9 million in local sales taxes, compared with more than $21.1 million for the same 12-month period the previous year, the Edinburg Economic Development Corporation has announced. From November 2016 through October 2017, Edinburg’s retail economy produced $20,934,767.43 in local sales taxes, compared with $21,171,250.82 for November 2015 through September 2016, a decrease of 1.11 percent. The year-to-date figures, which under the reporting system used by the Texas Comptroller of Public Accounts, begin in November of each year and end in October of the following year. In terms of local sales tax revenue for October 2017, McAllen led all major Valley cities with$4,390,341.47, while Brownsville was second, ($2,765,731.12), Harlingen was third ($1,950,730.56), and Edinburg was fourth ($1,624,490.61). All figures are based on sales made in October 2017 by businesses that report tax monthly, according to the Texas Comptroller of Public Accounts. Texas Comptroller Glenn Hegar announced on Wednesday, December 6, 2017, that he was sending on that date $695.2 million in local sales tax allocations to cities, counties, transit systems and special purpose taxing districts, based on the October 2017 reporting period. The $695.2 million local sales tax rebates statewide represented a 10.8 percent increase from sales made in October 2016 by businesses that report tax monthly, according to the Texas Comptroller of Public Accounts. Weslaco: $886,379.30, up 0.51 percent compared with October 2016 ($881,823.37). Weslaco: $11,950,056.95, from November 2016 through October 2017, up 2.31 percent compared with November 2015 through October 2016 ($11,679,765.20). For details on November 2o17 sales tax allocations, which represent sales taxes generated in October 2017 by individual cities, counties, transit systems and special purpose districts, visit the Comptroller’s Monthly Tax Allocation Comparison Summary Reports. The Edinburg Chamber of Commerce held their 85th annual awards banquet on Wednesday, October 25, 2017 at Memorial Events Center in Edinburg. The event was attended by 250 local business and community leaders and featured a social hour with music and dinner. The banquet was emceed byElva Jackson Garza, Member, Board of Directors, Edinburg Chamber of Commerce (Edwards Abstract and Title Co.). The Edinburg Chamber of Commerce recognized many local well-deserved leaders including the 2017 Man of the Year Manuel N. Cantú, Jr. of Rio Valley Realty and 2017 Woman of the Year Linda Villarreal, MD of Memorial Medical Clinic. Cantú is a Realtor®/co-owner of Rio Valley Realty and is a partner in Red Rock Real Estate Development Group. He is married to Sylvia Cantú and has two daughters, Alyssa B. Cantú and Marla L. Cantú. Both daughters are graduates of the University of Texas-Pan American and are currently Associate Realtors at Rio Valley Realty. Manuel Cantú began his career in 1990. He, along with his partners, established Rio Valley Realty in 1994. Cantú has served on the Greater McAllen Board of Realtors, is a member of the National Association of Realtors, Texas Association of Realtors and the International Council of Shopping Centers. Additionally, Cantú has been a member of the Edinburg Rotary Club for 10 years. He has served on the Rotary Board of Directors, where he is the Chairman for Hunters for the Hungry. Among his many other accolades and achievements, he has been honored with awards such as Rotarian of the Year, Cajunfest King and is a recipient of the Paul Harris Award. Presently, Cantú is Co-Chairman on the Hidalgo County Subdivision Advisory Board, a member of the Lone Star National Bank Advisory Board, and was recently reappointed by the Mayor and Edinburg City Council as a member of the city’s Planning and Zoning Commission. Linda Villarreal, MD, was born and raised in Edinburg, attended Sacred Heart School, Edinburg High School, then Pan American College for one year before going to the University of Texas at Austin. She received a BS Degree in Pharmacy and practiced for 10 years before returning to medical school in 1980. She graduated from Universidad del Noreste Medical School in Tampico, Mexico and went on to do her medical student clinicals with the University of Houston, assisting in a research project at the state school in San Antonio. She did her internship in Cleveland, Ohio and then went on to do her Internal Medicine Residency at Texas Tech Regional Academic Health Science Center in El Paso. Upon completion of her residency she arrived in Edinburg to establish her solo practice in General Internal Medicine at 1501 S. Closner in August 1989, where she still practices today. Villarreal has volunteered her time to many organizations including Hope Free Medical Clinic, Arthritis Foundation Board, Joints in Motion Marathon Foundation, Hidalgo-Starr County Medical Society President, Chief of Staff at Edinburg Regional Medical Center for 2000-2001 (the only woman to have held that position). She has served on the board for Easter Seals for 20 years serving as Chairman of the Board during that time receiving the Humanitarian of the Year award from Easter Seals. She has served on the Board for the American Heart Association and was honored as a Heart of Gold recipient, and has been honored by Zonta International, which is a leading global organization of professionals empowering women worldwide through service and advocacy. The Edinburg Chamber of Commerce also recognized outgoing and incoming officers and board members who serve the organization with dedication and enthusiasm. Among them was Jacob De León (Memorial Funeral Home), the Immediate Past Chairman (2016-2017), Board of Directors, Edinburg Chamber of Commerce. De León was presented a commemorative plaque and the coveted President’s Red Jacket for his service to the Edinburg Chamber of Commerce. Also honored that evening was Alex Ríos, who now serves as Chairman, Board of Directors, Edinburg Chamber of Commerce. Ríos is owner of Kids’ Kollege Learning Center and works as District Director for State Representative Terry Canales District 40. Ríos is currently 2017 -2018 Chairman, Board of Directors, Edinburg Chamber of Commerce, and has been a member and volunteer since 1998. Throughout the years with the Edinburg Chamber of Commerce, he has served as Vice-Chair of Special Events, Vice-Chair for the Ambassadors, Vice-Chair for Leadership Edinburg Program, and Director of the Board. With the help of the committee, Ríos has helped events like Fiesta Edinburg and Texas Cook ‘Em: High Steaks in Edinburg, become the top-rated festivals to attend in the Rio Grande Valley. 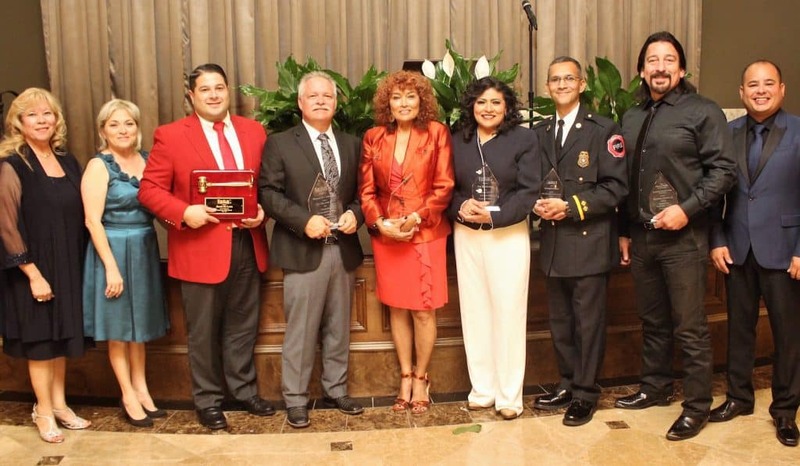 The Edinburg Chamber of Commerce also recognized the 2017 Ambassador of the Year Pat Barrientos (Edinburg Executive Center); 2017 Leadership Award Recipient Martín Martínez (City of Edinburg Parks and Recreation Department) and the 2017 Edinburg Fireman of the Year Gabriel Espinoza Jr.
For more information on the Edinburg Chamber of Commerce Annual Banquet, contact the Edinburg Chamber of Commerce at 956/383-4974.